Prison is a lonely and isolating time. 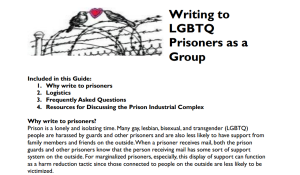 Many gay, lesbian, bisexual, and transgender (LGBTQ) people are harassed by guards and other prisoners and are also less likely to have support from family members and friends on the outside. When a prisoner receives mail, both the prison guards and other prisoners know that the person receiving mail has some sort of support system on the outside. For marginalized prisoners, especially, this display of support can function as a harm reduction tactic since those connected to people on the outside are less likely to be victimized. The following are two resources to help you coordinate either a one-time card writing party or an ongoing pen pal friendship as a group with one or multiple prisoners. Click on the images below to download the resources.